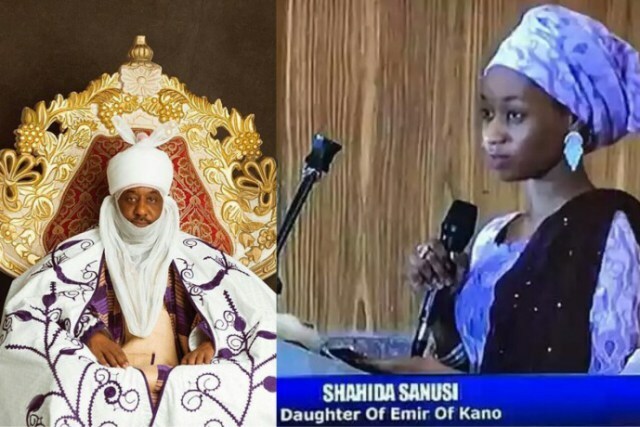 The Emir of Kano, Alhaji Muhammad Sanusi II was represented by his daughter, Shaheeda at the BBOG movement’s third anniversary lecture for missing Chibok girls in Abuja last Friday. At the Transcorp-Hilton Hotel venue of the event, Shaheeda said that she just became the first female in northern Nigeria to represent an Emir at a formal event. While she appeared to have some inkling about the criticism that was bound to trail the development, and her not so conventional or inadequate use of the veil, her father’s introduced her in a video message that preceded his daughter’s prepared speech. “Let me tell you something about the young lady who is going to read my speech. When she was in Form 3, I remember an incident that is probably relevant for today. Her mother came to me and said: ‘You need to talk to your daughter’ and I asked her: ‘Why?’ “She said: ‘Your daughter slapped a boy in school’. It is a bit strange so, I called Shaheeda and said: ‘Shaheeda, I heard that you slapped a boy in school. Why did you do it?’ “Then she said: ‘Dad, that boy has no respect for women’. So, I asked her exactly what she meant by that. It turned out that one day, during prep in the afternoon, in full class, the boy had come to her, and put his finger to her forehead and pushed it backwards, and he was in the habit of doing it to all the girls in the class. She had said nothing apparently and waited until the next day. She walked into the prep class late, the whole class was full, and she walked up to him, slapped him, and said: ‘That was for yesterday’.